VANCOUVER, BC / ACCESSWIRE / November 15, 2018 / Ximen Mining Corp. (TSX-V: XIM) (OTCQB: XXMMF) (the "Company" or "Ximen") is pleased to provide an update on the Gold Drop Property which is currently under option agreement to GGX Gold Corp. (TSX-V: GGX) and located near Greenwood in southern British Columbia. 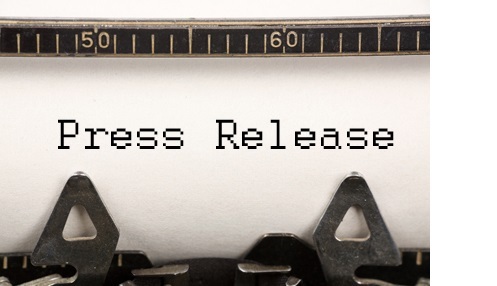 To date Ximen has received the first two of four option payments, which consists of Stock and Cash, from GGX Gold Corp. (See News Release of July 27, 2016). Once all the payments and work commitments have been completed, Ximen will have a 2.5% NSR and the right for nine months thereafter to elect to form a joint venture with the GGX Gold by paying to GGX Gold the amount of money equal to 30 per cent of the total amount expended on the property by the GGX Gold. If Ximen exercises this joint venture right, Ximen and GGX Gold will enter into a joint venture for the exploration and development of the property. - Pilot bulk sample concentration testing of 18kg of Everest Vein outcrop sample material across a gold shaker table identifying sample grade as 20.51 g/t gold. 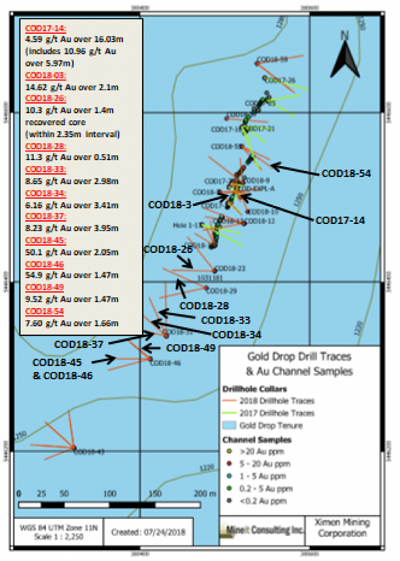 The 2018 Fall diamond drilling program is targeting the gold bearing COD vein, with the focus being on an area of previous high grade gold drill intercepts. GGX Gold Corp. (formerly Revolver Resources Inc.) optioned the 2150 hectare property from Ximen in June 2016 to acquire 100% interest. Additional staking in 2017 increased property to over 5,600 hectares. 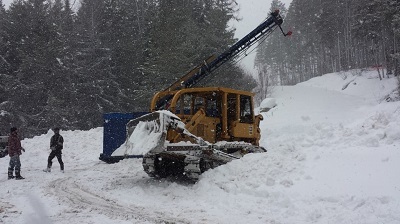 The initial recommended work on the property as part of an updated NI 43-101 in July 2016 consisted of a two-phased program with estimated expenditures of approximately $600,000. Phase II being contingent on Phase I. Phase I included partial rehabilitation and surveying of underground workings to access areas of documented significant veins and mineralization; underground geological mapping and systematic vein sampling in select areas; and structural mapping and vein channel sampling in select Ximen Mining Corp. 2014 trenches. The first priority area was in the historic Gold Drop – North Star workings. Phase II work at the Gold Drop - North Star vein and other priority areas included regional scale geological mapping/prospecting and sampling, geochemical and geophysical surveys with potential subsequent detailed surveys, and trenching with systematic geological mapping and vein channel sampling followed by bulk sampling of gold and silver bearing veins to evaluate gold and silver grade. 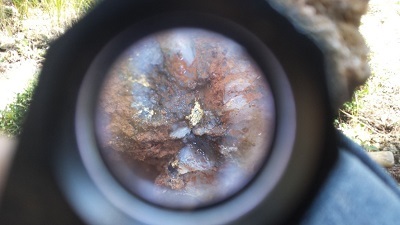 Work was directed to locate and sample historic working in the Gold Drop Southwest Zone. The first week of prospecting was successful in locating the C.O.D. shaft, and numerous freshly exposed bedrock outcrops with sulfide bearing quartz veins and quartz vein float boulders. Thirty-nine rock samples were initially collected and sent for analysis. Seven grab samples of quartz veining returned values in excess of 1 g/t Au with two exceeding 10 g/t Au; one adjacent to the historic C.O.D. shaft (19.65 g/t Au) and a bedrock vein sample along a new access road (14.10 g/t Au). This new vein showing is approximately 680 metres northeast of the C.O.D. shaft. (News Release of June 8, 2017). - Additional property staking to the west. Additional mineral claims staked to increase property to over 5,600 hectares. C.O.D. vein structure followed along strike for 160 m and remained open in both directions. Excavator trenching doubled the size of the exposed C.O.D. vein to 160 m along strike. (News Release of July 4, 2017). - First batch of channel sampling of C.O.D. vein returned up to 6.12 g/t Au and 72.8 g/t Ag. Initial sixteen 1.0m wide channel samples taken at approximately 1.5m intervals along exposed C.O.D. vein for strike length of 30m resulted in sample values ranging up to 6.12 g/t Au and 72.8 g/t Ag. (News Release of July 18, 2017). - Second batch of channel sampling of C.O.D. vein returned up to 43.2 g/t Au and 224 g/t Ag. The second batch of forty-nine 1.0m wide channel samples taken at approximately 1.5m intervals along exposed C.O.D. vein returned anomalous to high grade values for gold ranging from 0.2 grams /tonne to 43.2 grams per tonne (g/t) gold, with 34 channel samples exceeding 1 g/t gold. The samples also returned values of 2.6 g/t to 224 g/t silver. (News Release of July 26, 2017). - Discovery of Everest Vein located 600m southwest of C.O.D. vein. Chip samples collected across the approximate 0.4 m wide vein exposure returned up to 52.8 g/t Au and 377 g/t Ag, while a grab sample of a quartz vein boulder broken off the outcrop by the excavator returned 81.8 g/t Au and 630 g/t Ag (News Release of August 21, 2017). Drilling yielded encouraging results including Hole COD17-14 grading 4.59 g/t Au and 38.64 g/t Ag over 16.03 metres core length with a high grade core grading 10.96 g/t Au and 89.86 g/t Ag over 5.97 metres of core length (News Release of Sept 7, 2017). A 334 soil sample program extended the target area by at least 600m and during the sampling program a new vein exposure was discovered in a small, 2 m deep historic adit 175 meters north of the C.O.D. trench (News Release of November 8, 2017). - Location and sampling of historic Silent Friend and Ken veins as well as other historic working on crown grants southwest of the Dentonia Mine. Part of the fall prospecting focused on locating and sampling the Silent Friend and Ken veins near the Gold Drop Main Zone. Both of these returned significant values including 297 g/t Au and 1290 g/t Ag sampled in dump pile quartz from what is believed to be the southern Silent Friend showing. Samples of dump pile material from a mineshaft north of this exposure assayed 6.98 g/t Au and 38.6 g/t Ag. Material from a mineshaft to the south, speculated to be the Ken mineshaft, assayed 4.47 g/t Au and 23.0 g/t Ag. (News Release of November 8, 2017). Time was also spent prospecting 6 crown grants in the central portion of the Gold Drop Property. These grants are southwest of the Dentonia mine. Several historic trenches pits and workings were found and sampled. A sample collected in one of these exploration pits assayed 6.13 g/t Au and 30.3 Ag. (News Release of November 8, 2017). 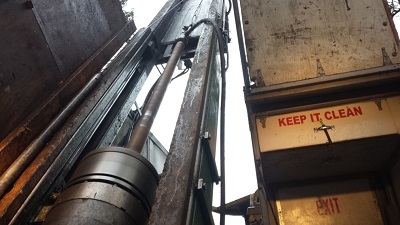 Extensive exploration work has now been completed in 2018 consisting of drilling, trenching and bulk sample concentrating. Results from trenching which discovered the extension of Gold Drop vein system south of the underground workings are pending. 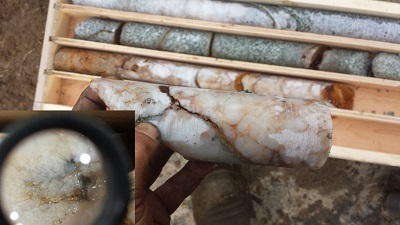 This extension was highlighted by a vein exposed for 20m across widths from 0.6 to 2.0m trending north-south containing sporadic pyrite, chalcopyrite and trace amounts of galena mineralization. (News Release of September 20, 2018). Trenching focused on Silent Friend and Ken gold bearing vein systems is also pending (News Release of October 17, 2018). The 2018 Fall Drilling Program on an area of previous high grade gold drill intercepts has started with the completion of three holes (News Release of November 6, 2018) and will continue through the rest of the year. 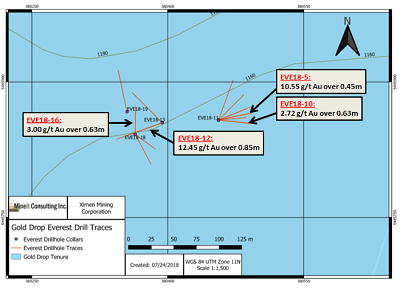 - The 2018 drilling program also tested the continuation of the Everest Vein, which is located southwest of the COD Vein worksite. Chip samples collected in 2017 across the approximate 0.4 meter wide vein exposure returned up to 52.8 g/t gold and 377 g/t silver while a grab sample of a quartz vein boulder broken off the outcrop by the excavator returned 81.8 g/t gold and 630 g/t silver (News Release of August 21, 2017).